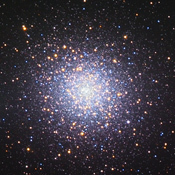 The exbibition of amateur astronomical photographs is installed at observatory in town of Kysucke Nove Mesto. I tested this lenses a few days ago. 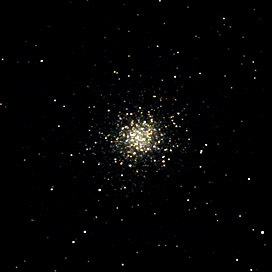 I borrowed it from my friend M. Minarik when I was taking some pictures of comet C/2007 F1 Loneos. Thanks for it. There are some test pictures. The exbibition of amateur photographs is installed in mansion Oscadnica (Kysuce, Slovakia). Now I used 300mm lenses. The comet has a little tail in the picture. 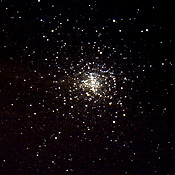 The exbibition of amateur astronomical photographs is installed in town of Liptovsky Mikulas in local house of culture. 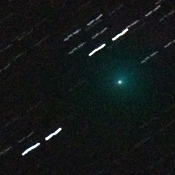 Perfect night, perfect comet. There is a result. It is small, but very important think. It enables me to use old lenses with DSLR. There is a new filter in my equipment. 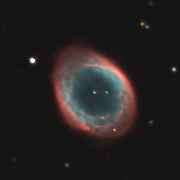 OIII filter is useful for observing and photographing emision and planetary nebuleas. There is a new filter in my equipment. 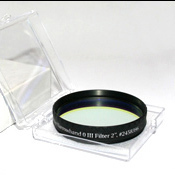 H-alfa filter is useful for observing and photographing emision nebuleas. 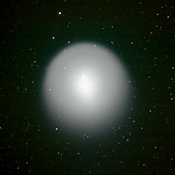 The comet in 0.36m telescope. Next try. The comet is still increasing. The comet brightened from 17th magnitude to 2,5. It is surprise. Unfurtunately - no tail. Next attempt. The tail is visible in the photo. There is a new comet on the west. Unfortunately it is too low over horizont and so photo result is poor. There are some new items in the section Wallpapers. North of Slovakia, Orava region. Here is place, where grew up a new private observatory. The main telescope is 0.6m Newton. There is a small travel-mount in my equipment. I have bought it for taking photos of constelations and meteors. I tested my new mount and constellaion Delphinus was tested area. Astro-3 is a small mount. I want to use it as a small travel-mount, also for astrophotography - for shorter focal length. 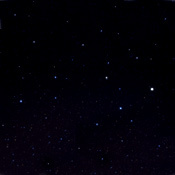 This constellation is small but characteristic. There are some quite interesting objects. 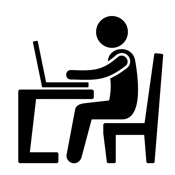 My web already registered over 100 000 visits. Thank you for your interest. There is a new map of pages. This feature enables users to show all categories and news. My astro web was offline. This state was caused by Slovak police. This planetary nebulae is probably best known. 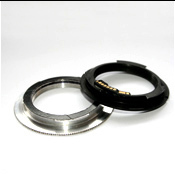 Ring is good object for observing. I tested new 35cm telescope in observatory Vartovka. There is a first result. 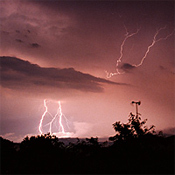 There is a beautiful large lightning from my car. Over 100 degrees on the sky. Better position of comet C/2007 E2 Lovejoy on sky, good weather and free weekend. The comet on sky, then in camera and now it is already on pages. 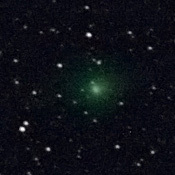 Last photo of comet C/2007 E1 Garradd. 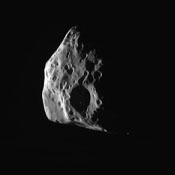 Yesterday I found information about flyby near-earth asteroid on SpaceWeather. Brigthness was quite good and so I tried it. 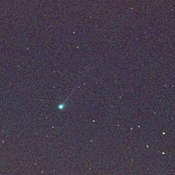 Next bright comet on the sky - C/2007 E2 Lovejoy. There is a first photo. Next try. Flyby comet past galaxy NGC 2906 is good for comparision of brightness of objects. Clear sky, weekend and comet C/2007 E1 Garradd on the sky. A challenge to my camera. There are new links to amateur personal pages and there is section with wallpapers for desktop of your monitors. 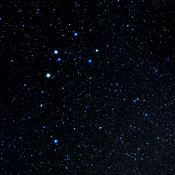 The constellation Taurus is full of large open clusters. Third large cluster is Cr65. Information about taxes only for Slovak inhabitans. 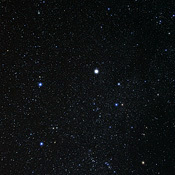 There are many interests crowded in constellation Scorpius and its surroundings. 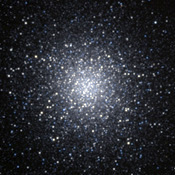 One of them is globular cluster M4. 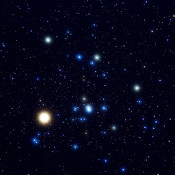 Open cluster Hyades is like sister of Pleiades. 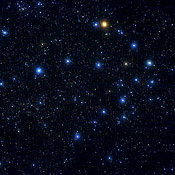 This cluster is situated in the middle of constellation Taurus. 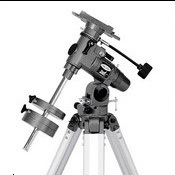 There is a new banner on my pages - a new dealer of optics, telescopes and astronomical accessories. Complete sortiment and price list is available on web site www.teleskop.sk. There is installed exhibition of my photographs in these days. The exhibition is called Life in space. There are some new items in the section Links. 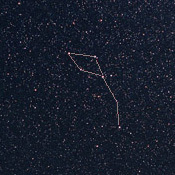 The name of this constellation exceptionally corresponded with its shape. 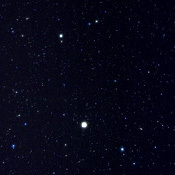 Dominant of constellation is star Regulus (1,35mag). 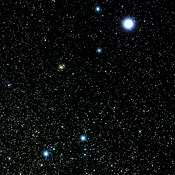 Constellation Bootes je easy identifiable by very bright star Arcturus. 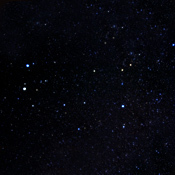 Positions of main stars is slight resembling constallation Orion. This constellation is inexpressive. 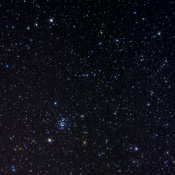 But there is a lovely open cluster M44 in the middle. It is great object for binoculars. Next photo from last weekend. This constellation is very large. I have taken photograph of head of Hydra today. Clear sky, weekend. There was not else chance than to go under stars and make some photos. 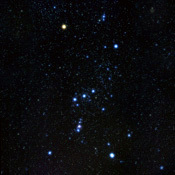 Constellation Orion is very characteristic and full different objects. If you want to leave a message for me you can do it in this guest book. After negative observation of occultation I decided to test new Tamron lens and difusion filter Cokin. 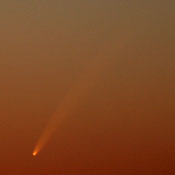 The comet McNaught is already hot news several days on the sky. Its gradual approaching Sun has been decreasing its angle distance from our star. The new year has begun and I have decided to find some time for reconstruction of my pages. Unfortunatelly I must say that I have prepared to do it about one year. I did not achieve to find some time at all.